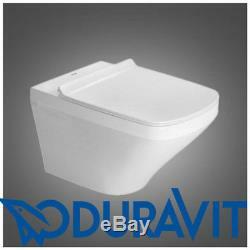 WALL HUNG WC FRAME RAPID SL&###xA0; AND&###xA0; RIMLESS DURAVIT WC PAN WITH SOFT CLOSING SEAT. 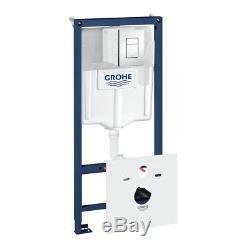 GROHE RAPID SL 1.13M WALL HUNG WC FRAME 5 IN 1&##xA0. THIS IS THE MOST COMPREHENSIVE SET OF TOILET FRAME ON THE MARKET. YOU RECEIVE EVERYTHING WHAT YOU NEED TO INSTALL THE WALL HUNG PAN. 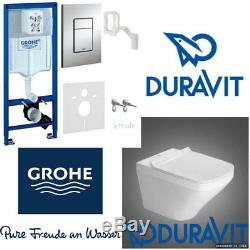 1 x GROHE &###xA0;RAPID SL FRESH 38827000 TOILET CISTERN FRAME&##xA0. 1 x SKATE COSMOPOLITAN BRIGHT CHROME FLUSH PLATE. 1 x FIXING WALL BRACKETS (set of 2). 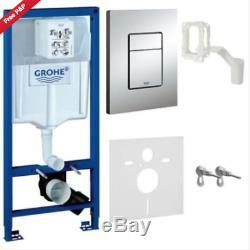 1 x GROHE SET FOR NOISE PROTECTION FOR WC. 1 x GROHE FRESH SET. 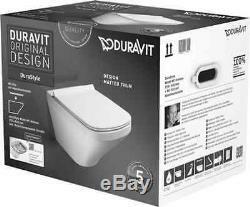 DURAVIT DURASTYLE RIMLESS WALL HUNG WC & SOFT CLOSING SEAT. This compact wall hung WC&###xA0;features a stylish design alongside a crisp Alpine White finish that would suit any contemporary bathroom. Product Code: 45510900A1 (Wall Hung WC) and 006379 (Soft Closing Seat). Dimensions: Height: 355mm x Width: 360mm x Depth: 540mm. Quick release&###xA0;soft close toilet seat included. 1 x WC Toilet Pan. 1 x WC Seat with soft closing metal hinges&##xA0. The innovative impression given continues within the design of toilet and bidet: The flat seat & cover, available with and without a soft-close system, is eye-catching. Wall-mounted and free standing toilets can also be combined with the shower toilet seat SensoWash&###xAE; DuraStyle by Starck. Ceramics and seat blend into a harmonious, elegant unit. Designed by Matteo Thun and&###xA0;Antonio&###xA0;Rodriguez. Rimless Pan - thanks to the open easily accessible rim the bowl is particularly easy to keep clean and hygienic, it considerably reduces cleaning time and effort. Soft closing seat - thanks to the soft closing mechanism of the metal hinges a gentle tap is all it takes to close the toilet. Or call: 7494 22 66 00. FEEDBACK upon the receipt of your order very much appreciated - thanks! Shoudl you need an invoice with&###xA0;VAT stated separately, please get intouch or add note to your order at the check out. In addition in most listings we offer additional (extra paid) service in case you need your product sooner. You can return a product you bought from us within 30 days. You will have to cover the cost of posting the product back to us. Any claims for short deliveries, goods damaged in transit or incorrectly dispatched&###xA0;items must be advised within 7&###xA0;days of the receipt of goods. Therefore, &###xA0;please make sure you check your product/products in the specified time. Please be aware that this is your responsibility to check the product detail and item specificswhere the information is provided. If in doubt please get in touch before placing the order, so we can help. While we endavour to ensure that the product info and specs are correct, we do not warrant the accuracy of the material on the listings. Produer specs can ater at any time and we endavour to note these changes but cannot be held responsible for alterations beyond our control. We strive to give our&###xA0;customers a&###xA0;positive&###xA0;experience with our personal customer service and always are seeking to find a satisfactory&###xA0;solution for all issues should they occure. 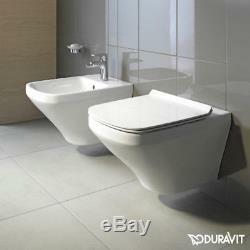 COMPLETE SET INCLUDES WALL HUNG WC FRAME RAPID SL AND RIMLESS DURAVIT WC PAN WITH SOFT CLOSING SEAT 1. DURAVIT DURASTYLE RIMLESS WALL HUNG WC & SOFT CLOSING SEAT This compact wall hung WC features a stylish design alongside a crisp Alpine White finish that would suit any contemporary bathroom Product Information: Product Code: 45510900A1 (Wall Hung WC) and 006379 (Soft Closing Seat) Dimensions: Height: 355mm x Width: 360mm x Depth: 540mm Wall mounted design Rimless Quick release soft close toilet seat included Water consumption: 4.5L The box includes: 1 x WC Toilet Pan 1 x WC Seat with soft closing metal hinges The innovative impression given continues within the design of toilet and bidet: The flat seat & cover, available with and without a soft-close system, is eye-catching. Wall-mounted and free standing toilets can also be combined with the shower toilet seat SensoWash® DuraStyle by Starck. Designed by Matteo Thun and Antonio Rodriguez. The item "GROHE WC FRAME & DURAVIT DURASTYLE RIMLESS WALL HUNG WC TOILET + SOFT CLOSE SEAT" is in sale since Friday, December 14, 2018.